Growing up — Wendy Bickis Photography Wendy Bickis Photography ~ Family and Lifestyle Photographer, Chilliwack, BC. Lately I have been feeling the creative urge to write again, and having decided to take a social media break for 30 days, I thought that writing for my blog would give me the chance to discover new ways to share my work, and fill my soul in a different way. At the moment I am completing a 365 project where I take a daily photo and learn as I go about my life, my life as a mother, my life as photographer, and how I see the world. It’s a challenge, but it’s also a gift, because it makes me stop and see the beauty in the every day. Today I captured my son as he played hockey after school with his friends in the back alley. As I look through the photos, I can’t help seeing them as teenagers in ten years. It seems like it will be forever but I know that in the blink of an eye they will all be taller and handsomer, and faster, and won’t want to be photographed. They’re growing up. 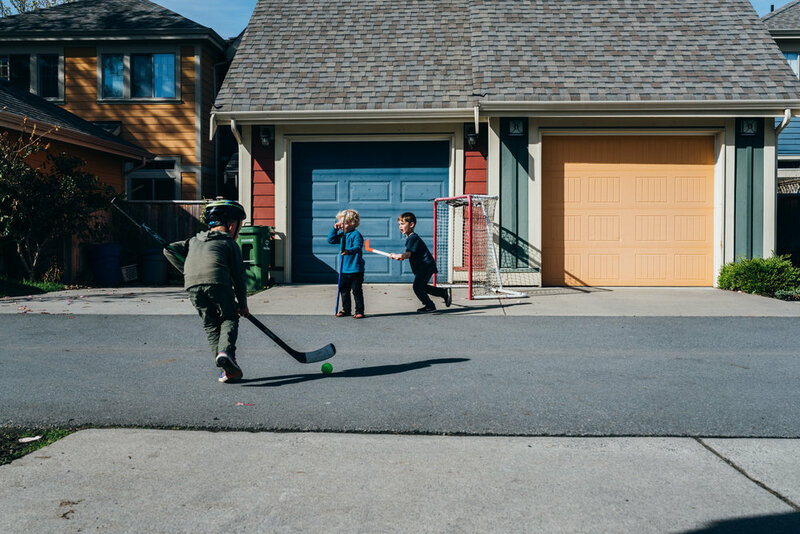 And as hard as it is to know that they won’t be little forever, I take comfort in that in ten years they will still be the essence of who they are, just older and hopefully a little wiser - still neighbourhood friends, playing hockey and enjoying the beginning of spring.